If there’s a universal truth all moms accept, it’s that becoming a mother basically means you’re agreeing to be in a time crunch until your little chickies fly the coop. That time deficit starts even before they’re born — remember those nesting days when you ran around convinced there simply wasn’t enough time in the day to get everything done? The point being, life as a mom is the very definition of hectic. Worth it, 100 percent… but hectic, nonetheless. That’s why it’s so important for busy mamas to accept a little help in any form they can get it. Sure, you might not be ready to hire a personal assistant. Although let’s be real, that would be pretty sweet and we could all undoubtedly make good use of one. Fortunately, though, we inhabit a day and age where there are countless devices, apps and other ingenious inventions that cater to the time-impaired. From a pot that practically cooks dinner for you to an app that helps you make the most of every minute, every busy mama needs the following things. There are items that deserve the ultra-hype surrounding them, and there are items that do not. But make no mistake — the Instant Pot deserves all the hype. On busy days (or, let’s be real, every day) you can throw a bunch of ingredients in it and have a delicious dinner in half an hour. It’s that easy and that quick. For moms who live near major metropolitan areas, Instacart is a no-brainer. This same-day delivery service lets you find thousands of products from the stores you already shop at, and then drops whatever groceries you decide on at your door in as little as an hour. No more wasting time walking up and down aisles or waiting in line for an open register. When you become a mom, you’re lucky if you can suds up more than once or twice a week. You just sort of wind up hoping some of the bubbles from your kids’ bath will land on you. Of course, sporting greasy, unwashed hair doesn’t thrill you, but what are you gonna do? Dry shampoo the heck out of your coif, that’s what. 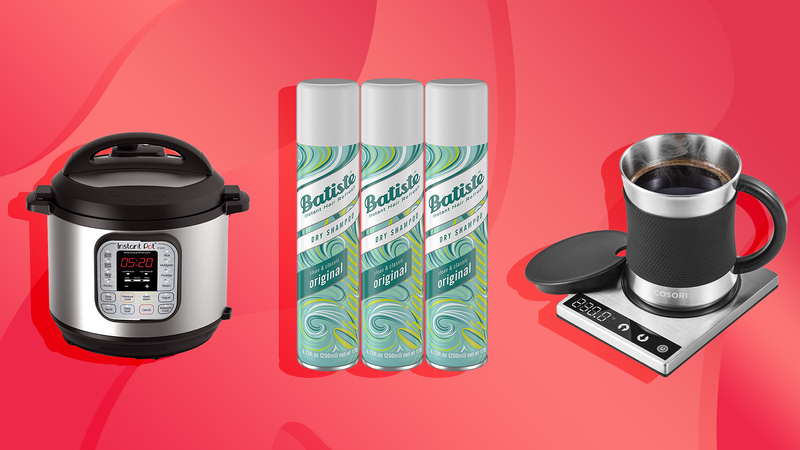 Batiste’s waterless formula absorbs dirt and grease to revitalize hair between washes. Bonus? It’s vegan-friendly. Raise your hand if you spend far too much time every day reheating a single cup of coffee before ultimately pouring it down the drain (*raises both hands*). You know the drill — you pour a cup of coffee, get busy and forget about it, put it in the microwave to zap it, forget about it, re-heat (again! ), forget about it and repeat on loop. But the Cosori coffee mug warmer and mug set eliminates the roughly one million extra trips to the microwave. Not a coffee drinker? You could easily use this for tea, too. Calling all pet mamas! Whether you work out of the house or are heading on vacation, sometimes you need to find someone who can take care of your fur babies. In the past, this entailed calling friends and family frantically, spending hours you didn’t have on the phone trying to find someone trustworthy. But that was before the Rover app, which lets you browse hundreds of trusted dog sitters near you. You can even receive photo updates directly from your sitter in the app, so you also won’t waste unnecessary time worrying. Carving out time to get ready in the morning already feels like Mission: Impossible, so many mornings the busy mama has to cull her hair routine. But bless the soul who invented this two-in-one hair straightening device. A combination between a hairbrush and a flat iron, it gets hair sleek and out-in-the-world ready in one easy step. It’s a vacuum that vacuums without you. Like, you don’t even have to be home. If you don’t already have one of these little angels, move it to the top of your must-have list. While Roomba used to be the only name in the robotic vacuum game, options abound now. The Coredy robot vacuum cleaner is one such option, and it has close to 250 positive reviews on Amazon. Our favorite feature? Boundary strips you can lay down to keep the Coredy out of designated areas. After a long day running all over the place doing everything for everyone, Mama needs time to decompress. And you know what that means, right? Mama needs vino, and she doesn’t want to spend 20 minutes struggling to open the bottle either. An electric wine bottle opener makes uncorking an effortless affair. Dear mama, you deserve a massage. No arguments — you know it’s true. What you also know to be true, though, is that you don’t always have time to travel to a spa and spend half a day there getting pampered (still, you should do that from time to time, too!). So, let the Soothe app come to your rescue. You browse massage therapists near you and book one for any time from 8 am to midnight, seven days a week. In as little as an hour, a licensed massage therapist will show up at your door armed with everything necessary for a spa-quality massage experience. This may seem like an indulgence, but it really should be a necessity for busy moms. Why? For starters, it reduces kitchen waste up to 90 percent of its original volume — and it only takes three hours to go from scraps to a garden-ready pile of compost. You don’t have to fuss with worms or oversized bins or anything else. Just set it and forget it!